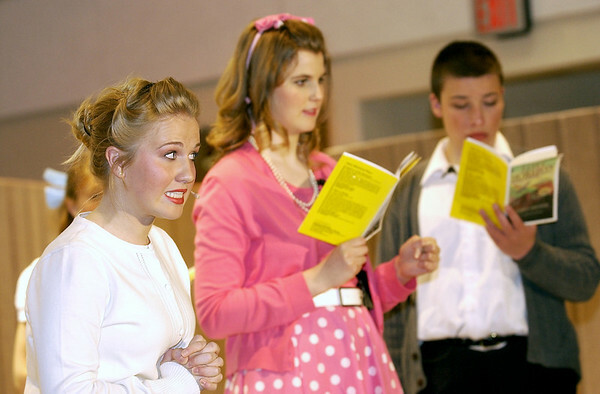 Traverse City Christian School High School presented the comedy "Our Miss Brooks" Thursday and Saturday in the school auditorium. The play is based on the hit situation comedy of the same name, which stared Eve Arden as beloved high school English teacher, Connie Brooks. Proceeds from the performances support the TCCS Theatrical Department. Debby Fay, as Miss Brooks, informs the girls she has plenty of tissues on hand for tears after they don't get their part in the school play in a scene from the Traverse City Christian High School production of "Our Miss Brooks."